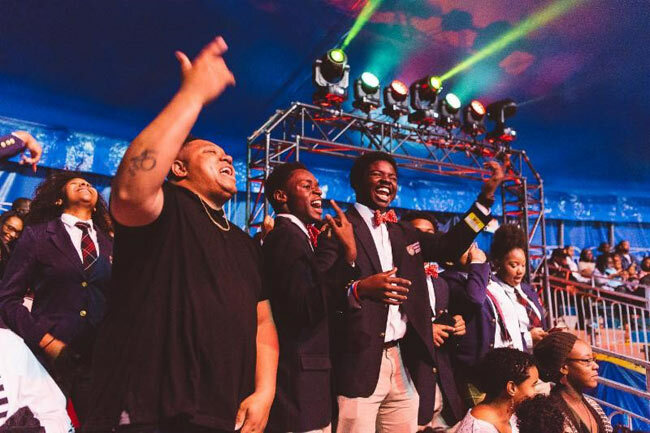 (Reach Records; Atlanta; March 22, 2018) – Reach Records’ Rapper Tedashii celebrated his birthday weekend and the release of his new single, “Smile” by hosting a group of Harvard Debate Council students at a recent performance of the Universoul Circus in Atlanta. The Harvard Debate Council Diversity Program is an Atlanta-based diversity pipeline program designed to raise the young social and political voice in urban Atlanta and matriculate African-American students into the Harvard Debate Council's summer residential program at Harvard College in Cambridge, Mass. The Universoul Circus is a world-class, cool and hip live entertainment attraction for families that has been seen by more than 19 million people, in more than 60 million households, in person and on both local and national television networks. The circus embraces and celebrates the unique and familiar aspects of global cultures and ethnicities into a stellar production that blends circus arts, theater and music. To keep up with Tedashii, visit Tedashii.com and follow @Tedashii on Twitter, Facebook and Instagram.